We get asked to fix these kinds of heat marks a lot. Sometimes the solution is to fully strip the old finish off and re-polish the item of furniture but in general it’s a more straightforward fix. These marks are certainly unsightly but don’t imagine that the piece is ruined, it’s very seldom, if ever, that the timber is damaged beyond repair by a heat mark (see the don’t throw it out post). At worst, there may be a slight dip in the timber where it’s been softened and marked with the heat but this can normally be sanded out. 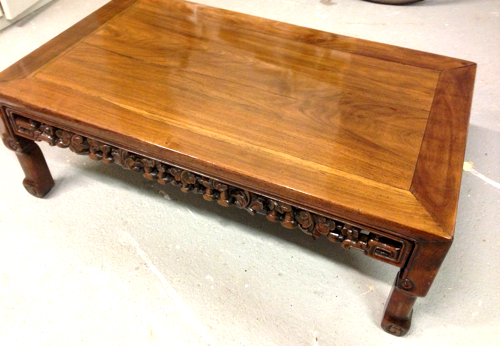 This is an unusual little Walnut coffee table and it’s great to be able to restore it to it’s former glory. 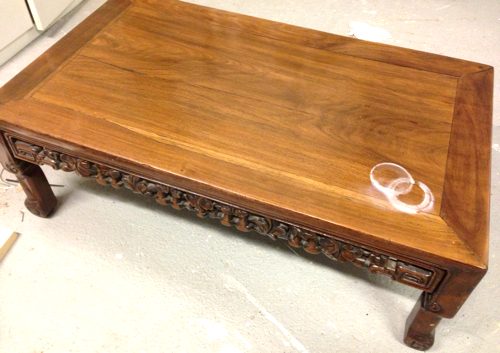 We removed the heat mark and revived the rest with French Polish. This table should now last for many years to come. The heat marks are now removed and French Polish used to revive the finish.